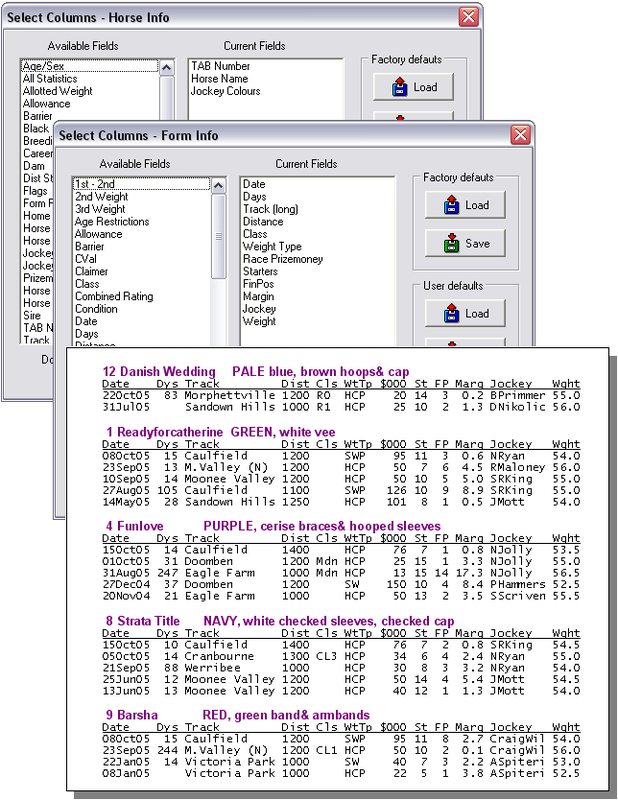 To select which types of data you wish to print in your Form Printout, click Setup on the GTX Menu Bar, then click Print. The Setup Printout Parameters box will open. Click on the ‘spanner’ button in the section you want to configure. 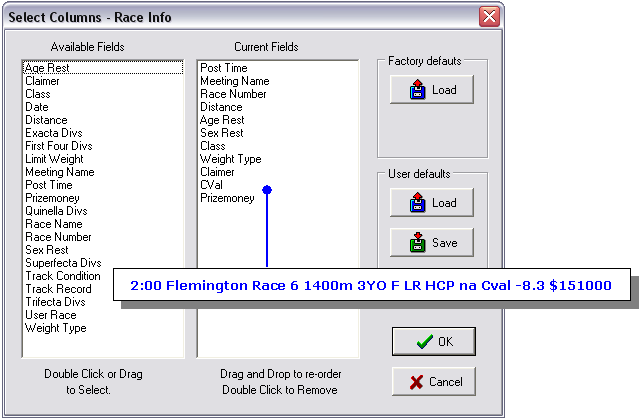 For example, if you click the ‘spanner’ button in the Race Info section, then the Edit Fields – Race Info box will open, displaying the various fields that are available for you to include in the Race Info section of the printout. In the image below you will see in the Available Fields list on the left, all the fields that are available to be included in the Race Info section. 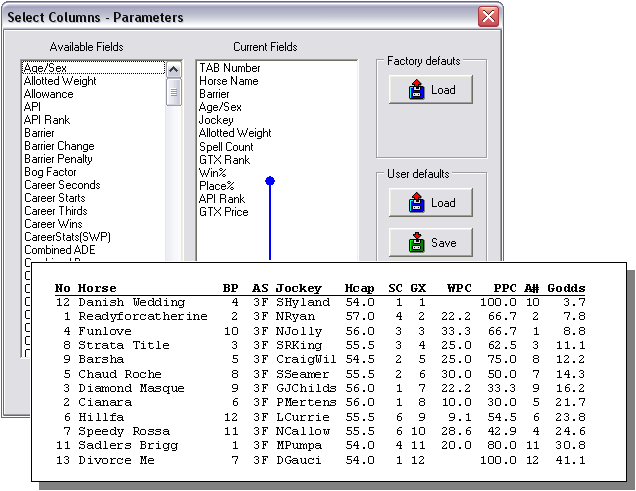 On the right, in the Current Fields are the fields that are currently selected to be included in the Race Info section of the printout. Also shown is the Race Info line of the printout which results from these Current Fields. Our final example section of printout relates to the Horse and Form sections. Notice the blank line, or white space under each horse's form to separate it from the next horse. This is achieved by placing a checkmark, or tick, in the +Line checkbox. See Entering Blank Space. You can also Enter a Page Break at any point. To Remove a field from the Current Fields, simply double-click it. To add a field to the Current Fields, locate the field in the Available Fields list, and drag it to the desired position in the Current Fields list. Alternatively, you can double-click the field in the Available Fields list, which will add it to the bottom of the Current Fields, from where you can drag it to the desired position. Remember to select only as many fields in your printout that will fit across the paper, otherwise each line will wrap to the next line, leaving you with a jumbled mess.